In my 30+ years in Sensory and Consumer Science, I often find clients trying the same approach in their research requests. A common scenario is a client with a large-scale problem that warrants a complex study design. It requires multiple demographics across several regions of the country, and subsequently the budget to support that type of endeavor. They make a decision based on the outcome of the study and experience great success from it. That same client then returns with another research request that is of a much lower priority and does not have a significant ROI to justify a large budget. At this crossroads, many clients struggle to understand their options. Many resort to a quick and dirty internal product evaluation fraught with bias. Then they are forced to spend time attempting to turn this “Friday afternoon experiment” into actionable data. That’s like an Olympic gymnast adding a belt to that one-size-fits-all t-shirt. Instead, we like to introduce what we call right-sized research. This is research that focuses on your business objective with a keen eye on in-budget delivery. In effective consumer testing, right-sized research means concentrating on fine-tuning demographics, rather than the highest respondent rate. Often panelists’ compensation can account for a large proportion of study costs. Although we love large data sets for their undeniable statistical robustness, often we can achieve good guidance data from a smaller set of consumers that are closest to your target audience. Further, in consumer testing, we may use combined techniques like a traditional central location test plus spin-off interviews to gain additional insights in a timely fashion. The combination of these techniques in one consumer test allows a significant amount of data to be collected without inviting consumers in for a second session the next day. It also allows us to drill down on specifics with a subset of the test respondents to offer our clients greater insights. The same principles hold true for when a client needs discrimination testing. If we look at discrimination methods, we may suggest a tetrad over a triangle test to reduce the respondents needed and maintain power in the test. We also have known discriminators in our databases that have been screened for acuity. Employing these respondents in a test, rather than an average consumer, ensures we have the best respondents for the job. Other times when I witness the budget-crunch dilemma is in shelf life testing. The longer your shelf life the more expensive the study, right? That isn’t necessarily true. 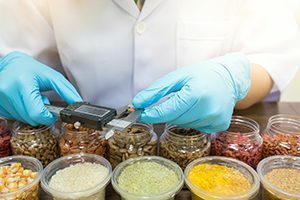 If done correctly, shelf life testing should balance the length of the intended shelf life, what is known in the literature about changes in your product over time, and the ability to place sampling points strategically over time. Shelf life studies should also be holistic and use microbial, chemical, physical and sensory data to describe changes in a product over time. With our experience as an independent testing lab for all foods, we have a great deal of historical knowledge on how foods age over time and where pivotal changes will occur along a shelf life study. We can suggest when and what time points will be most valuable, as well as what types of testing methods/analyses would best highlight these changes. We can also categorize your products into product families. Product families have similar pH, water activity, formulations and packaging schemes and allow researchers to extrapolate shelf life data from one product to another. This decreases the total number of studies to be conducted. In addition, we use accelerated shelf life testing to reduce the length of a shelf life study and get you to market faster. Let’s consider selecting a study design that fits the specific problem or issue and falls within the financial guard rails that are set around that product or category. Finally, Mérieux NutriSciences can also advise on right-sized physical testing parameters. Clients pair physical testing parameters, like defects and dimensions, with analytical testing to monitor product quality. These testing schemes work well to watch quality across a supply chain and monitor co-manufacturers. The challenge is to identify quality issues without examining every piece of product in a case. Mérieux NutriSciences’ scientists can advise on sample sizes that balance strong analytical data within your budget. Often, analyzing a full case is not necessary and we work with clients to understand variability in the product to determine a right-sized sampling scheme. Get to a place or enlist a partner that can help you find “the right fit” for each situation. There are definitely situations that require large tests in order to safely move through the decision-making process and render favorable technical and financial outcomes. However, there are many opportunities to tailor test designs to fit the issue at hand without exceeding financial limits for the product or product category. Mérieux NutriSciences is well versed in tailoring the correct test to properly fit your budget and objective and deliver actionable results that best fit your situation. You do not have to shop your research with a “One Size Fits All” approach. All in all, researchers would benefit from a quick call to one of our scientists to discuss testing options. Let Mérieux right-size your research. Jean Ann has over 30 years of experience in the Sensory and Consumer Science Industry. She has worked at Mérieux NutriSciences for nine years now. Prior to that, she worked for Campbell Soup Company, University of Arkansas and Sensory Spectrum, to name a few.